Competition is tough in the hotel business. It’s no longer enough to offer top-notch services and provide clients with an amazing experience that will prompt them to post a great review online. Nowadays, hotel managers also need to aggressively promote their business to reach a wider audience. Building a stunning and comprehensive website isn’t optional anymore, it’s a must. 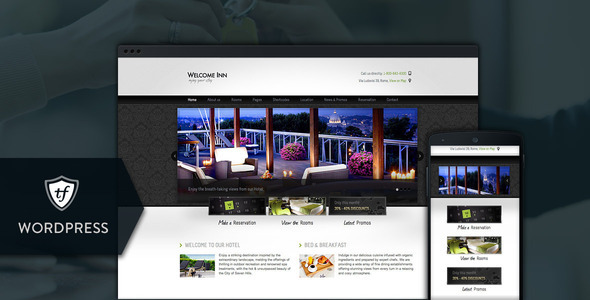 To give you a head start, we’ve gathered the 10 best hotel WordPress themes on the market. Packing gorgeous design and amazing functionality, these themes will allow you to showcase your services in an elegant manner and hopefully even convince potential customers to book a room. 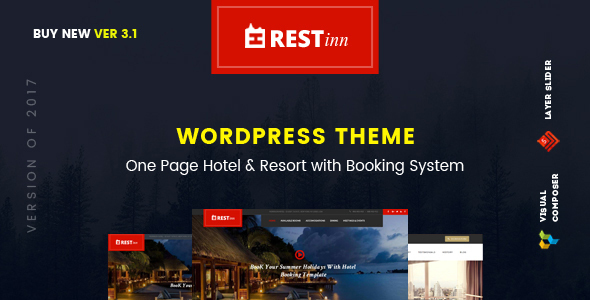 Designed for both single branch and multi-branch international hotel chains, Restinn is an amazing hotel theme that boasts a one-page design and booking capabilities. Choose from multiple demo options, integrate a complete payment system using PayPal, Stripe, and Paymill, among others, and even manage all of your guests’ reservations from one convenient location. Control bookings, receive and send messages, and even implement the pre-designed Reservation Form on your site making it easier for site visitors to plan their vacation. 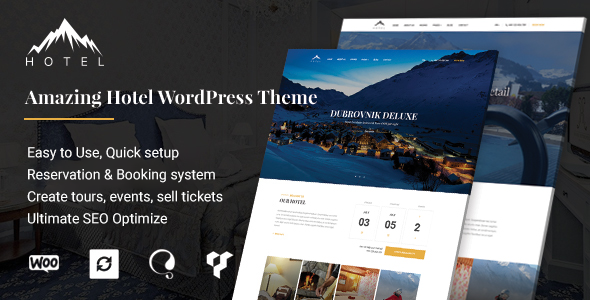 Hotel WP is a luxurious and powerful hotel theme designed for Bed and Breakfasts, hotel, hostels, resorts, and rental services. Providing easy ways to manage room listings, customer bookings, and reservations online, you will never have to worry about not selling out. In addition, add pricing plans and coupon deals, and showcase your accommodations using the drag & drop Visual Composer editor. Hotel Master comes with an awesome room booking system, coupon post type so you can create coupon codes for customers, and hostel features. You can add/remove services with ease and quickly customize the site to match your brand. 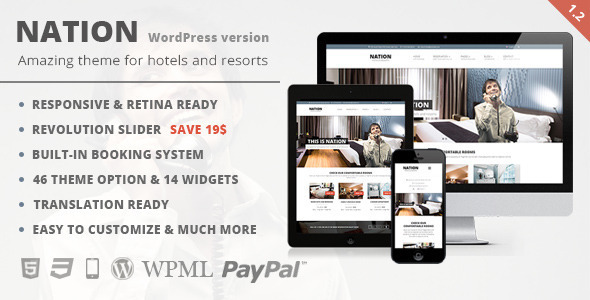 This great WordPress theme also offers a comprehensive payment system – clients can choose between PayPal, Stripe, PayMill, and Authorize.net. Managing your bookings is intuitive, creating sliders is a breeze, and the beautiful admin panel will help you keep things simple. 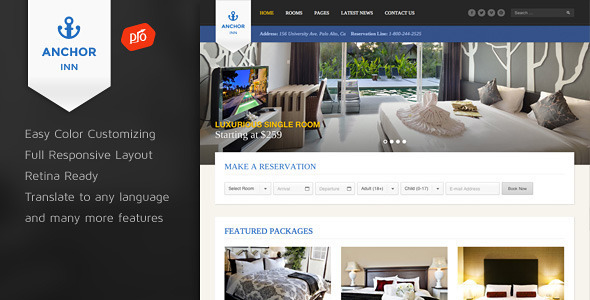 All in all, one of the best hotel WordPress themes on the market. Bellevue is beautiful, fast, and offers a plethora of features for the busy hotel manager. The theme comes with its own page builder that is a pleasure to use, as well a built-in booking system and availability calendar that are both extremely user-friendly. You can customize every area of the page without breaking a sweat and you can showcase your room and services with style. 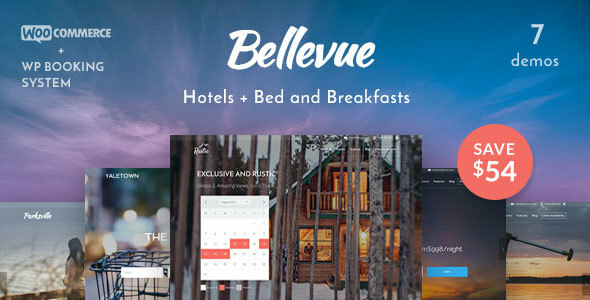 In short, Bellevue is one of the best hotel WordPress themes on the market, surely worth the investment. 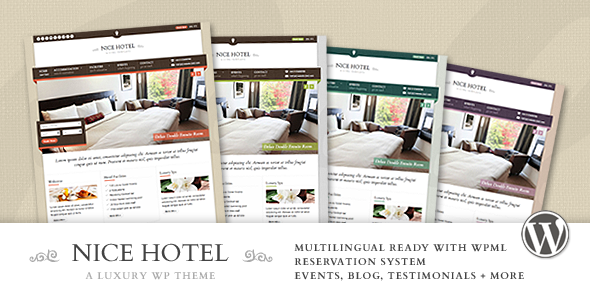 If you run a hotel, motel, or resort, Holiday is the perfect hotel WordPress theme for you. Include room filters for potential guests to navigate easily, build a customized booking form, manage bookings from one convenient location, and fill your rooms ASAP. In addition, personalize your website to match your brand with over 500+ Google fonts, light and dark color schemes, and unlimited accent colors using the intuitive color picker. Altogether, Holiday will have everyone who visits your website wanting to take a holiday and stay with you. What makes Soho Hotel stand out from the crowd and win a spot on our best hotel WordPress themes list is its top-notch booking system. Visitors can check availability and make reservations with ease. You have the option to set a per person or per room pricing scheme, set separate adult / child pricing, and send custom booking messages and emails. Moreover, you can also ask for a deposit via PayPal or bank transfer. Besides, Soho Hotel also comes with stunning design and it’s very easy to install and customize. What more could you need? Starhotel is a trending hotel theme ready to get your resort, hotel, bed and breakfast, or motel in the spotlight. For example, enjoy the included reservation form so online site visitors can book their stays right away. In addition, build beautiful layouts using the Visual Composer drag & drop page builder plugin. Lastly, translate your site’s content to reach a global audience with the popular WPML WordPress plugin. Altogether, Starhotel is one of those hotel themes you can’t overlook if awesome design and high quality functionality is what you are looking for. 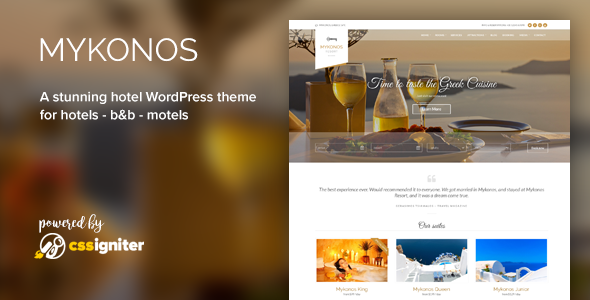 Mykonos Resort is an exceptional WordPress theme offering business owners all the features their resort website could possibly need. 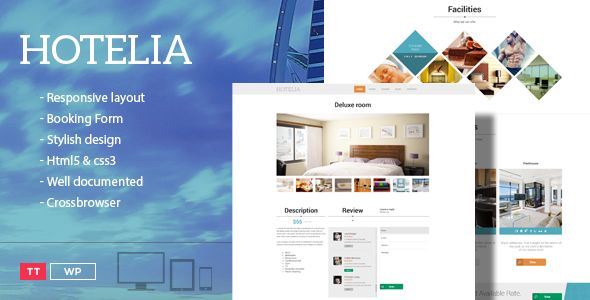 For instance, display your accommodations in stunning layouts using the widgetized homepage. More so, enjoy complete room management, seven custom post types, and even a built-in booking form so your visitors can get in touch. In the end, this powerful hotel theme comes packed with customization options and functionality to power your business into the green. 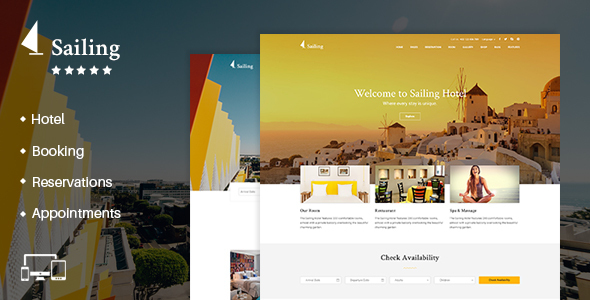 No list featuring the best hotel WordPress themes would be complete without Sailing. This smooth and gorgeous WordPress theme comes with a complete hotel booking system you’ll fall in love with. Also included: several other booking features your clients will adore. It has a drag & drop page builder and includes the Revolution Slider plugin for amazing effects. It also offers 5 unique demos to choose from. Setting up a website was never easier. 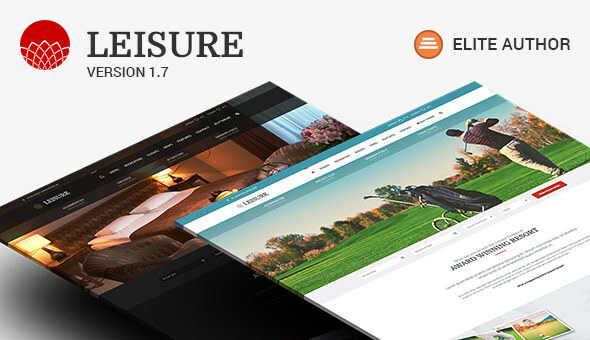 Hotel Leisure is a WordPress theme that fits any type of hotel. It boasts an intuitive design that will help you feature your services with style. It’s very easy to customize and comes with great support. The theme also bundles three premium plugins for great value – Visual Composer, Revolution Slider, and Simple Weather. Designed for websites with large, beautiful images, multi-level menus, and generous footers, Hotel Leisure is uniquely suited for eye-catching displays that will instantly grab visitors’ attention. 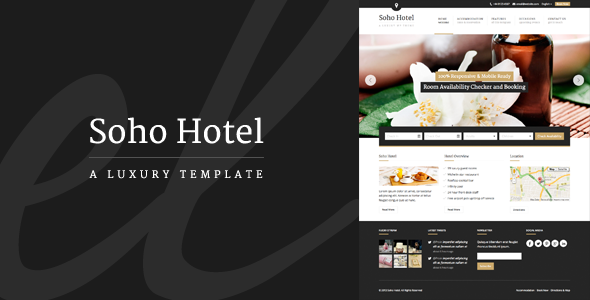 Clearly, one of the best hotel WordPress themes available. 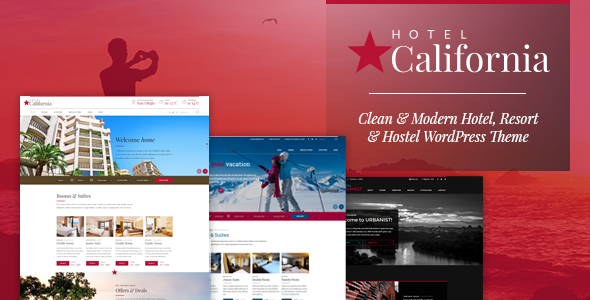 Hotel California is a clean and modern theme well-suited for any type of resort. It has been tested to work across various devices, from the largest of desktops to slick smartphones. The theme comes with a cost calculator and booking forms, as well as on online shop that’s easy to set up. 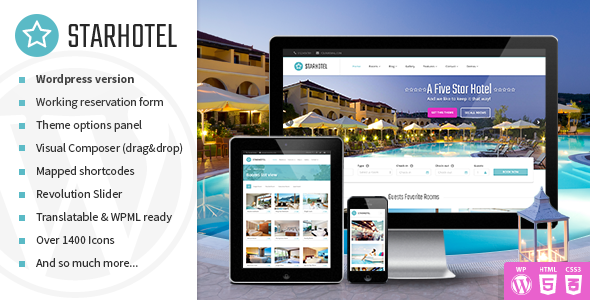 Its carefully selected and crafted features will help any hotel manager build a stunning and functional website. A cheerful and colorful WordPress theme that basically screams vacation. Viva Hotel stuns not only due to its great design, but also its advanced features. The theme is powerful and flexible, bundles the Slider Revolution plugin, and offers a variety of shortcodes that will come in handy. It’s also multilingual ready and incredibly easy to tweak. Nation Hotel is a premium responsive hotel theme perfect for all types of accommodation websites. With a user-friendly reservation system guests will be able to set the date they want to stay with you in a few easy steps. Additionally, you can manage all of your hotel’s bookings, create booking calendars, and create easy checkout forms as well. With 46 theme options, 14 built-in widgets, and translation capability for those coming from other nations, your hotel, motel, B&B, or hostel will be packed every night with satisfied guests. A fully functional WordPress theme that’s fast, reliable, and stunning? Yes, please! Paradise Cove packs all the features you need to design your impressive website, from a cool reservation system to amazing sliders that will dazzle visitors. Plus, Paradise Cove comes with a bunch of built-in page layouts for you to use, from Rooms and Services to Locations and Amenities, so setting up your page will be piece of cake. You also get a handy weather widget to show the local conditions, something potential clients will definitely appreciate. This fully featured hotel theme has everything you need to convince people to vacation with you. With retina ready image support, and unlimited color schemes for easy branding of your hotel, Anchor Inn boasts a clean and modern looking that is as enticing as your rooms. Utilize the built-in booking form, share special deals with site visitors, and even include buttons, tabs, toggles, and multiple column layouts using the included shortcodes. With Anchor Inn you are bound to have a “No Vacancy” sign outside in no time. Clean and stylish, Hotelia is a WordPress theme meant for those who want to keep things simple, yet greet potential clients in an elegant manner. It comes with a functional booking form, unique effects and functionality, and video background support. Social media integration is also supported, and the smooth transition effects will bring your hotel website to the next level. 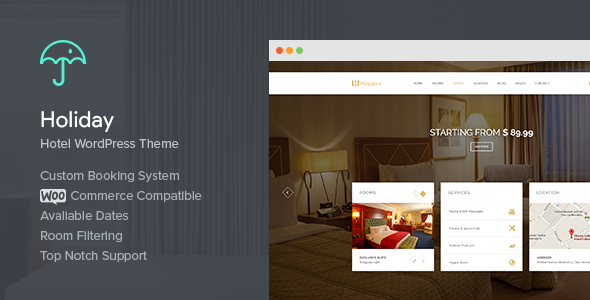 Hotec is a sleek, clean, and responsive hotel theme designed for spa, resort, or hotel businesses. With a built-in translation tool, stTRANSLATOR, you can easily cater to an international audience which is perfect in the hotel industry. In addition, build a beautiful site with the smart drag & drop page builder and change everything from sidebars to colors, social integrations to background images, all using the advanced theme options panels. Implement multiple slider designs, choose from four homepage demos, and don’t forget to add contact and reservations forms to book your hotel to the max. Nice Hotel comes with a bunch of valuable features needed by hotel owners of all kinds. For instance, easily add descriptions of rooms and services with Nice Hotel’s built-in accommodations management system. Better yet, allow visitors to book a room or service, and have the reservations sent directly to your email so you always have a heads up on your hotel’s activities. Lastly, translate your content for international visitors using the WPML translation plugin, choose from 4 pre-drfined skins or create your own, and enjoy free support as part of your theme purchase. Welcome Inn is a polished and easy to navigate WordPress theme. Its main purpose is to help you revamp any page of your website. It comes with a reservation request form for your visitors and guests. You also get multiple page layouts, advanced SEO options, and a smooth animated slider. The theme is also translation ready and user-friendly. You will have no trouble setting it up. 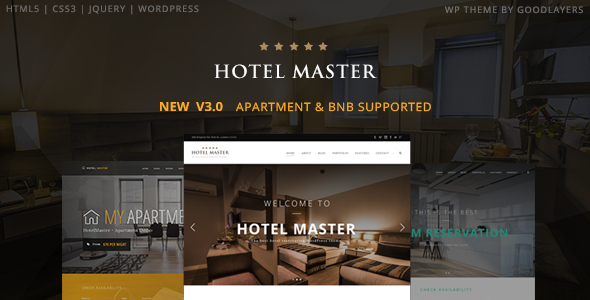 Why Choose One of the Best Hotel WordPress Themes on Our List? Managing a hotel is no easy job. No wonder building and updating your website can fall down on your list of priorities. We strongly advise against that. A gorgeous web page is a great tool to convince potential clients to try out your services. Not to mention it can make the difference between struggling for customers and being fully booked. Pick one of the best hotel WordPress themes on our list and you’re good to go. You’ll take the first step towards polishing your online presence and becoming a go-to destination for eager travelers. Thanks to WordPress you no longer have to hire a team of designers and developers to build you a website. Go ahead and pick any of the best hotel WordPress themes on our list. You will be able to get a gorgeous site online without breaking the bank. Or even learning a single line code. All the themes featured above are insanely easy to install and customize. You can have your site up and running in a matter of minutes. As always, for more WordPress tips and tricks keep browsing our website or subscribe to our newsletter. I am aware of most of themes except a few but still wonderful collections of themes you’ve listed here. @Ann – I actually think it should be added to this listing. Nice looking theme you got there.